I saw the same article and posted it here on the forum. 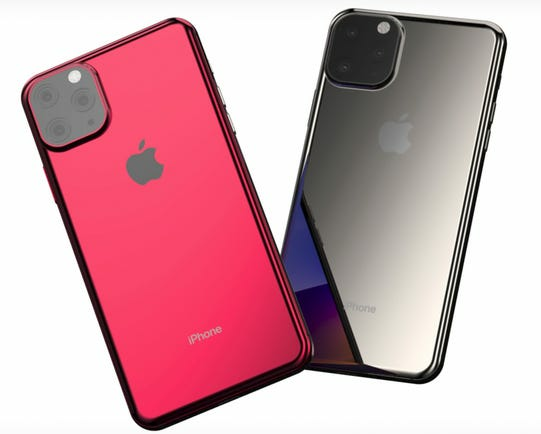 Who knows what will happen these are just rumors but apple does not have the best track record with proprietary ports/cables so I won't hold my breath for a type c connector on the new iPhones. Most likely, I agree, they're going to keep lightning for at least a year or two, unless their community really turns against them. I used Apple beside others when I was working. Now I have left only an old IPHONE an IPAD and an IPOD. All older than 10 years now. These are really of good quality, though there is no more update/upgrade possible, but I do not care as long they work. But I would not buy new devices from that company, because too expensive. This is OK for the things she does and she is happy. That's one of my major gripes with new Apple products. The price would be justifiable if the products were durable but that is not the case. It is my personal opinion that Apple uses inferior components on purpose knowing their products will fail within a few years with the hope of selling more products. Don't give me wrong apple is not the only company that is guilty of doing this but I feel they have taken it to an extreme in the last few years. Their tablets bend easily their phones bend easily their computers are non upgradable and you have to hire a rocket scientist to fix them if you do not send them to Apple directly who charges an arm and a leg for labor and most of the time recommends unnecessary fixes replacing whole logic boards for at least $500 when a $0.15 fuse would do the trick and on and on and on. I have to agree, Apple likes doing their own thing. But this will work only if they make good products. of money for this will not work for ever. Eg. We run a washing machine here. This fantastic piece of workmanship is doing the job for 30!!!!! No intergrated WIFI, not much electronics, simple. The same : A dish washer from MIELE. Running for ca 25 years now. I only had to swap the pump 2 years ago. This company exsist and their products are pretty high prized. But I dont think the products are as good made as in those old days. I think products in this quality will NEVER show up in our days anymore. This is a real problem of our wasting society. Agreed, they don't make em like they used to. I'm also a firm believer in buying quality products that will last as long as possible and do not end up in a trash dump somewhere or floating around in the ocean. I can understand companies wanting to make products that will need to be replaced over and over again but I do not respect that way of thinking and think it is highly irresponsible. iPhone sales have taken a huge hit in the last year due to rising iPhone prices and people holding onto their phones for longer. I believe that people are starting to wise up to apples planned obsolescence game and are fed up. Also people in Apples largest markets cannot afford to pay $1,000 or more for a phone that is only slightly better than last year model every two or three years especially when there are competitors selling comparable phones for a fraction of the price. Ja Jesse, exactly my thoughts. There my be apple fans here who might disagree. There are other companies may be not with better, but more worth the money products. As there no real innovations are created by Apple they will come to standstill. This is dangerous for a such a snooty company. Back to the roots, but I think that is not possible no more. I'd love to see Apple go with USB-C in their iPhones, but given how much money they bring in with just licensing for 3rd party Lightning cables, I don't see it happening, especially with other companies making USB-C to Lightning cables now. I love my iPhone, but I know there are Android devices that do some things better. 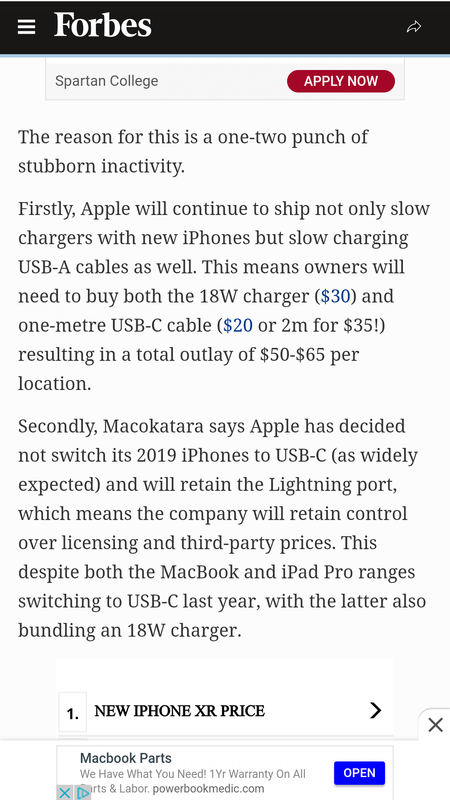 It'll be interesting to see what happens first: Apple ditching Lightning for USB-C or Anker ditching Micro USB for USB-C.
Agree on most items for the hardware part, however iOS software is better in terms of security, patched and less segmented than Android. Interface is simpler than Android though they are playing catch-up with Android. It might have been a hint that Anker released USB-C to Lightning cable that Apple may not ditch the lightening cable after all, other providers may start producing more. Both OS are based on UNIX somehow. Best and most secure OS is LINUX. Not so often used, so there is no market for virus' and malware. And LINUX-users are mostly poor, old electronic hobbyists. This. People should talk more like this. The best camera phone of the world can take nice photos. The 10th best camera phone can, too. The difference between them is so small it ultimately doesn't matter. Brands were caught (not naming names here) using professional DSLR photos as if they were taken with a smartphone, and of course the Internet caught up with it. Cameraphones on top shelf are truly good, almost as good as standalone point-and-shoots. The difference isn't in megapixels, or in quantity of lenses: it's in sensor size and capacity of shifting focus. Cameraphones, regardless of brand, will never be able to beat a good camera on sensor size alone. The best camera is the one you always have with you, they say. It's true, and it's where convenience happens. I love having a very good camera on me at all times. But any time I want truly great photos, any time I sense I can capture great moments when I go out, I take my real camera with me. So many people are turning away from iPhones now and this doesn't help. Coming from an Android user iPhones are decent and iOS is decent as well (I still prefer Android), but why not use USB-C? Comparing photos I do with the CANON (Makro lens) to ones I take with my tablet : there is really a great difference. But who uses such real cameras in our days? Carrying those around, with a huge pile of different lenses. If so, where should we store our power banks, chargers, torches and speakers from the company? Apple seems to refuse to fully integrate with society. Most likely they will wait until their next "great cable advancement" to change their current peripherals. The Macbook pro had mag-lock, mag-loc 2 and finally usb-c because they threw in the towel. Their preference is to control all aspects, which is both good and bad really.